DJ wins at Labor Day 5K! Won a door prize that is. Kim and I ran the Fort Worth Labor Day 5K today, and the only thing won by someone named Dewey was my 4 coupons for bagels at Einstein Bros. I usually never win anything though, so it was pretty cool. It was raining like crazy all day, so we got totally soaked. I think we were slowed down quite a bit by the 15 lbs of water in our clothes and shoes. 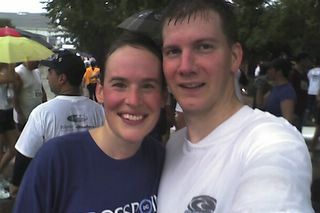 Note to self: don’t go running the day after Fast Sunday when everyone has been fasting and praying for rain. Prayers were answered in a big way. 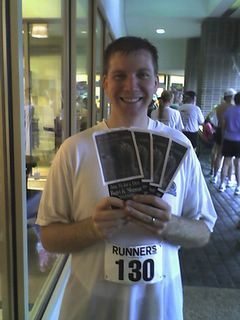 Anyway, it was my first competitive 5K, and it was really fun. I ran it in 25:52, which I was pretty happy with.